Opening this week's CWA Legislative-Political Conference, CWA President Chris Shelton asked participants to lead the fight to win back power for working people in this fall's elections. "We need to go from protest to politics, from protest to power," Shelton said. "And that fight starts right now." Shelton highlighted recent attacks on working people by the Trump administration and Republicans in Congress, including the corporate tax cut bill, the appointment of Neil Gorsuch to the Supreme Court, and the appointees to the Labor Department, NLRB, and National Mediation Board who have begun systematically reducing protections for workers on the job. He also stressed the need to ensure that the Democratic Party takes a stronger stand on issues that affect working people and their ability to join together to negotiate strong contracts. In her remarks, CWA Secretary-Treasurer Sara Steffens detailed the resurgence in worker organizing and local political activism, much of which is being led by CWA members and retirees. "I know we are at the beginning of a new era for working people," Steffens said. "And CWA is leading the way." Speakers during the first day of the conference represented the kind of elected officials that have won support from CWA members because they are committed to fight against the corporate CEOs who are using their massive profits to take power away from the people and devastate our communities. Conference participants heard from Ohio Senator Sherrod Brown; Charlotte, N.C., Councilmember Braxton Winston; and West Virginia State Senator Richard Ojeda. CWA Legislative Director Shane Larson reviewed recent legislative victories, including CWA members' success at preventing anti-worker legislation and advancing bills at the state and federal level that protect call center jobs. CWA Political Director Rafael Navar moderated a panel discussion on how to replicate last year's electoral victories in Virginia state legislative races, featuring Virginia Delegates Lee Carter and Jennifer Carroll Foy, Doris Crouse-Mays, President of Virginia AFL-CIO and Jon Liss, Executive Director of New Virginia Majority. CWAers at the conference attended workshops on topics including combating inequality, telecommunications policy, democracy, NAFTA, online campaign tools, call center legislation, and getting-out-the-vote. Delegations of CWA members met with their Senators and Representatives to discuss key issues and ask for their support. CWA opened the second day of the conference to members of allied organizations who are part of our common fight against Wall Street, the big banks, and the corporate elite. This unprecedented event, called "We the People 2018," drew national attention and was livestreamed by NBC News. President Shelton gave the opening address, and the standing-room-only crowd heard from Sens. Cory Booker (D-N.J.), Kirsten Gillibrand (D-N.Y.), Kamala Harris (D-Calif.), Bernie Sanders (I-Vt.), Elizabeth Warren (D-Mass. ), Rep. Luis Gutierrez (D-Ill.) and Rep. Pramila Jayapal (D-Wash.). Members of the audience engaged with the speakers. CWA Local 1109 member Bianca Cunningham, who worked with her coworkers to organize her Verizon Wireless store and five others in Brooklyn and was unfairly fired in 2015, encouraged Sen. Harris to commit to supporting legislation that strengthens workers' rights to join together and penalizes companies that engage in illegal anti-union activity. The speakers also expressed support for crucial issues like strengthening workers' rights, protecting Medicare and Social Security, holding Wall Street accountable, acting on DACA, and much more. CWA opened the second day of the Legislative-Political Conference to members of allied organizations who are part of our common fight against Wall Street, the big banks, and the corporate elite for an unprecedented event called "We the People 2018," featuring Sens. Cory Booker (D-N.J.), Kirsten Gillibrand (D-N.Y.), Kamala Harris (D-Calif.), Bernie Sanders (D-Vt.), Elizabeth Warren (D-Mass. ), Rep. Luis Gutierrez (D-Ill.) and Rep. Pramila Jayapal (D-Wash.). At the American Airlines shareholders meeting in New York this week, an Envoy passenger service agent demanded answers from the CEO and board of directors about how they can approve increased multi-million dollar payouts for top brass while many of their workers at Piedmont and Envoy must rely on food stamps and other forms of public assistance because of poverty pay. At the meeting, Envoy agent Takisha Gower said, "I am here on behalf of my 9,000 coworkers at Envoy and Piedmont who are seeking fair pay for our work, and fair union contracts. We are the face of American, and we're expected to project a positive image. But we are treated like we don't have value. We are negotiating in good faith, yet American is refusing to agree to pay family-supporting wages and put agents on a career track." Business is booming at American. The company made almost $2 billion last year, got a huge tax cut from the Republican corporate tax cut bill, and paid millions to executives. Meanwhile, 9,000 passenger service workers at American-owned Envoy and Piedmont Air still have to survive on poverty pay. Workers from CWA Locals 3371 and 3372 at Windstream in Kentucky reached a tentative agreement with the company last week. Workers' mobilization efforts in Lexington where the negotiations were taking place helped encourage Windstream to negotiate a fair contract. 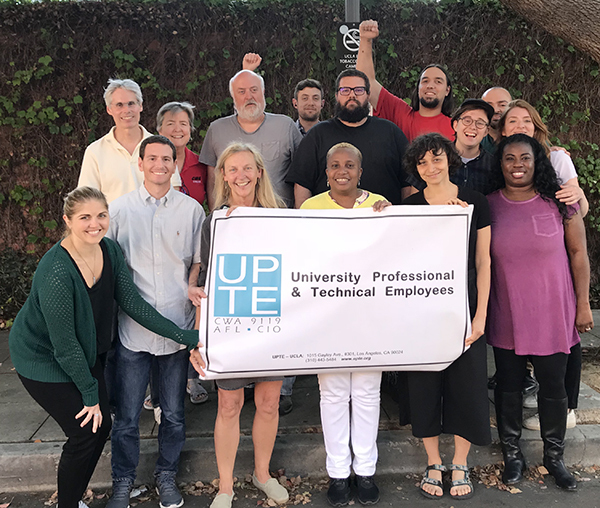 A unit of 35 social workers and marriage and family therapists at the Foothill Community Clinic in San Jose overwhelmingly voted to join CWA Local 9423. The campaign was led by Robert Hogue, Vice President of CWA Local 9423 and Monica Alvarado, Secretary-Treasurer, with the assistance of Victor Serrano, District 9 Organizing Coordinator. A 28-worker unit of AT&T Mobility Louisiana cellular and switch technicians joined CWA. The organizing was a team effort by the Louisiana CWA local presidents, led by Mandeville Local 3404 President Dave Pierce and supported by Hattiesburg, Miss., CWA Local 3509 organizer Sedgerick Lee. Over the last six weeks, CWAers have been joining tens of thousands of people across the country to participate in nonviolent direct actions to fight back against the structures that are undermining our democracy and supporting economic injustice. This week, CWAers rallied in Washington, D.C., marching to the Supreme Court where CWA President Shelton, Secretary-Treasurer Sara Steffens, members of CWA's Executive Board, and other CWAers engaged in civil disobedience to draw attention to the progress that remains to be made on education, living wages, jobs, and housing. CWA Local 6450 President and call center worker Sarah Harreus spoke at the rally to highlight the ongoing fight for a fair contract at AT&T. CWAers rallied in Washington, DC, marching to the Supreme Court where CWA President Shelton, Secretary Treasurer Sara Steffens, members of CWA's Executive Board, and other CWAers engaged in civil disobedience with the co-organizer of the renewal of the Poor People's Campaign, Reverend William Barber, II, to draw attention to the progress that remains to be made on education, living wages, jobs, and housing. CWA Local 6450 President and call center worker Sarah Harreus spoke at the rally to highlight the ongoing fight for a fair contract at AT&T. 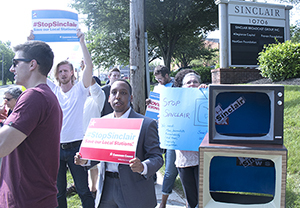 CWAers and allies gathered outside the Sinclair Broadcast Group's headquarters in Hunt Valley, Md., during the company's shareholder meeting to protest an attempted merger between Sinclair and Tribune Media. CWAers and allies gathered outside the Sinclair Broadcast Group's headquarters in Hunt Valley, Md., during the company's shareholder meeting to protest an attempted merger between Sinclair and Tribune Media. CWA has been fighting hard over the past year against the merger, which would result in one company becoming the largest owner of local broadcast stations in the country with more than 220 stations in 108 markets. Sinclair made national headlines earlier this year when a chilling video showed anchors from numerous local news networks owned by the conglomerate Sinclair Broadcast Group being forced to parrot right-wing talking points about "fake news" that could be taken straight from President Trump's Twitter feed. This merger, now under review by the Department of Justice and the Federal Communications Commission, would extend the reach of Sinclair from 38 percent of U.S. television households to 72 percent. Read more about the #StopSinclair rally here. CWA issued a statement congratulating AT&T for its court victory this week winning approval for its acquisition of Time Warner, but noted that the growth of the company must be accompanied by the growth of good union jobs. CWA also called on AT&T to resolve the outstanding contract negotiations in the Midwest and Legacy T, where workers have been standing up to save and grow jobs in their communities. Likewise, with the Time Warner acquisition, ensuring the freedom of workers at the combined company to join together and have a seat at the table is critical. 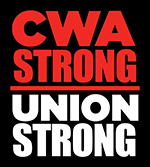 In the statement, CWA encouraged the Justice Department to respect Judge Leon's decision and allow the merger to proceed. Earlier this week, the Federal Communications Commission expanded its truth-in-billing rules to include wireless companies. CWA had encouraged the FCC to take this important step toward protecting consumers and customer service employees from corporate policies that encourage misleading sales tactics. Unfortunately, the FCC did not also expand its rules to all wireline technology, including increasingly prevalent VoIP services. CWA is also encouraging the FCC to investigate and address the underlying cause of deceptive sales practices – the unrealistic sales quotas and incentives that telecommunications companies impose on frontline sales and service employees. Corporations that impose unrealistic sales incentive structures and punitive performance management systems force frontline employees to meet these quotas and benchmarks or face the loss of compensation, or even their jobs.